Under what conditions will a bystander intervene to try to stop a violent attack by one person on another? It is generally believed that the greater the size of the crowd of bystanders, the less the chance that any of them will intervene. A complementary model is that social identity is critical as an explanatory variable. For example, when the bystander shares common social identity with the victim the probability of intervention is enhanced, other things being equal. However, it is generally not possible to study such hypotheses experimentally for practical and ethical reasons. Here we show that an experiment that depicts a violent incident at life-size in immersive virtual reality lends support to the social identity explanation. 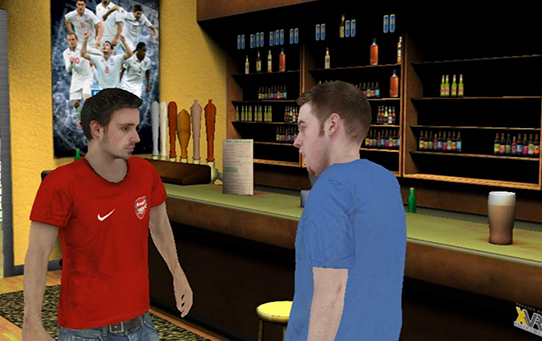 40 male supporters of Arsenal Football Club in England were recruited for a two-factor between-groups experiment: the victim was either an Arsenal supporter or not (in-group/out-group), and looked towards the participant for help or not during the confrontation. The response variables were the numbers of verbal and physical interventions by the participant during the violent argument. The number of physical interventions had a significantly greater mean in the in-group condition compared to the out-group. The more that participants perceived that the Victim was looking to them for help the greater the number of interventions in the in-group but not in the out-group. These results are supported by standard statistical analysis of variance, with more detailed findings obtained by a symbolic regression procedure based on genetic programming. Verbal interventions made during their experience, and analysis of post-experiment interview data suggest that in-group members were more prone to confrontational intervention compared to the out-group who were more prone to make statements to try to diffuse the situation.